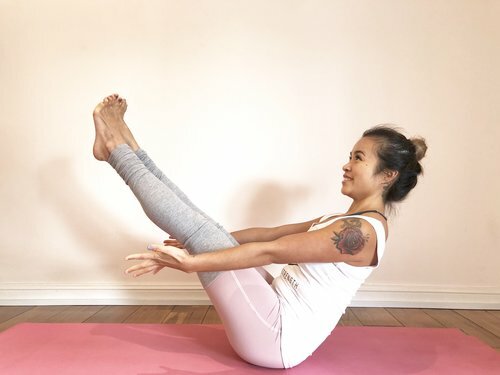 We share some step-by-step techniques on how to activate the core. With images to guide you on how to work your abdominal muscles. One of the most common ways we disengage the core is by tilting the pelvis backwards. This crunches the lumber spine and puts a lot of pressure into the lower back. Learn to tuck the pelvis back in by softening the sacrum and knitting your ribs in, so that your ribcage is not flaring out. Core strength is often neglected when standing and sitting, because it feels easier to relax the abdominal muscles and rely on our spinal structure to hold us up. However, muscles pull on bone and vice versa. So, if your muscles are slumping, your bones will follow. After years of poor spinal alignment, the bone structure becomes rigid in the wrong form and results in pain. A strong core can help elevate a lot of the pains and aches in your body. Although training your core is not the answer to all your aches and pains, having a strong core does prove to alleviate common body aches; the reason being that when our core is weak, our body naturally leans on using other muscles to overcompensate. As a result, we end up with overworked muscles all over our body and poor alignment. Let’s hope that the altered spinal structure doesn’t mess with the nerves in the spine….now, that opens up a whole can of worms….you get the point. The way to strengthen the core is not just by doing core workouts but to practice activating it in everything we do. This includes being idle standing/sitting or even walking. If you struggle to understand what it means to engage your core or how it should feel like, I have included two images below so that you can practice activating your abdominals and T zone (between your hip bone down to your pelvic floor). Lie down on your back with your knees bent pointing upwards and soles of the feet on the mat. Focus on pressing your belly down and drawing your lower back down towards the mat. Inhale and arch your lower back (imagine creating a small gap between the mat and your lower back). Then exhale and press lower back down to touch the mat (closing the gap so it feels like every vertebrae of your spine is touching the mat). The part of the motion done on the exhalation is how you feel when you engage your core and T-Zone. Repeat the inhalation and exhalation with their corresponding motions for 5 rounds of breath. This will help you activate those muscles and hopefully, start writing some memories in your muscles. Neutral Spine Position: Natural curvature of the spine. Create a small arch beneath your lower back. Imprinted Spine Position: Lower back is flat on the mat. Core is automatically engaged at this point. This is a great variation that works your core but puts less pressure on your wrist. Every yoga pose encourages you to engage your core, but if you have no sense of what core activation means, it may take a while for the muscles to wake up and for you to start feeling that you have a core! Don’t worry, we all started there. Try holding the poses for as long as you can and time it. Then slowly increase the time and push yourself to the edge a little each time. Before you know it, you’ll feel a lot stronger! Let us know how you go, if you have any questions or feedback for us. Comment below, email us or find us on Social Media where we are very active!